On this October Monday morning, I have re-discovered a real gem of a singer and his song. Burton Cummings is a Canadian Icon – a singer – songwriter who enjoyed enviable fame in the 60s and 70s while a member of The Guess Who. He later went on to performing solo and continues to do so with his Burton Cummings Band. He is the real deal and his voice is truly singular. I was fortunate to see him live back in the late seventies and his performance was truly riveting. I remember that he ended his show with a performance of his own composition, “I Will Play A Rhapsody”. He was simply seated at the piano and delivered a gorgeous acoustic version of this song. No other instrument necessary. Just his voice and the piano. I was going to feature this song in this week’s MasterClass Monday topic. 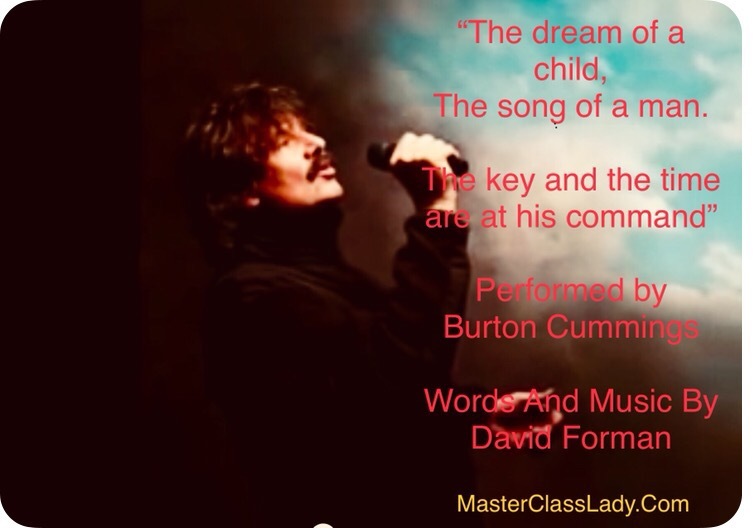 However, I recalled another song which I fell in love with over time and has come to take on new meaning for me as the years rolled by – “Dream Of A Child” . Burton never wrote the song – a gentleman named David Jesse Forman is credited for this. However, Burton Cummings covered this song in a manner that is truly meaningful and inspiring. His voice is incredibly expressive and his pitch is pure and focused. I suspect the man is blessed with perfect pitch and, if so, he uses this musical gift wisely and judiciously. But his phrasing! Therein lies the rub! He shows remarkable breath control when approaching his phrases, breathing in a creative and controlled manner. For example, he breathes after the word “key” rather than after “man” in the phrase “the Dream Of a Child, The Song Of a man, the key and the time is at his command”. This adds a fluid component and forward momentum to his phrase line. So expressive. I love inventive phrasing technique. It speaks to one’s musicality and the ability to bend phrasing to emphasize certain lyrics in the song. I had read – back in the day – that he had some level of classical training – in voice and in piano. And nothing hints to more to this fact than his ability to sustain his melodic line on the pure vowel, in each and every word in this song. His voice is always front and centre and his tone beautifully focused. This accounts for the fluidity of his phrase line, the evenness of his voice from top to bottom, supported beautifully from the diaphragm. You get a hint of the baritone timbre of his voice when he sings the word “steal” in the phrase “she told me how my best friend could STEAL my love from me”. No break in the voice or fluctuation in tone. Pure resonance from top to bottom. The video I have added below is a wonderful montage set to the original recording of this song. I couldn’t find a video of the original cover as performed by Burton Cummings; however, this video was beautifully edited and I hope you enjoy it. You can download this song on iTunes or steam it on Apple Music. And make those dreams come true. We are all children inside waiting to bust out and expose our wildest dreams. Share your thoughts in the comments section. MCL, I had the pleasure of seeing Burton perform the last concert with the Guess Who in Winnipeg, in the late ’70’s. Consummate performer, wonderful vocals the whole package. Yes, you are quite correct that he received classical piano training, my sister had the privilege of interviewing his mother for a local magazine article in Winnipeg. She confirmed that she managed to save enough money to send him for piano lessons. She was a single mother struggling to make ends meet, but wanted to provide the best opportunity for Burton to make the most of his gift. She passed away in 2013 I believe and he sang Stand Tall at her funeral. Someone in a documentary a few years ago, stated he could have had the best voice in rock, if he had wanted to continue touring with a band. I’ve always admired Burton’s playing style on the piano, it seems all the best players and singers have some classical training. It appears to be a big reason for their great success, Billy Joel also comes to mind, as well as Elton John. Vocab – such a great story. How fortunate that your sister interviewed his Mom. She sounds like a resilient and loving mother. And it is true. The best musicians are those with training and technical experience. Makes a huge difference. Thank you for sharing.